This 2 bedroom, 2 bathroom condo is found in the Summerhouse Family Condominium Resort. The charming interior décor features a sophisticated style of high end furnishings and accent pieces. The living area boasts sparkling floor to ceiling windows with breathtaking views and direct access to the spacious private balcony. This unit is perfectly situated in building B and offers an incredible view of sparking pools and sprawling coastline. At home convenience is found in the fully equipped kitchen with updated appliances, dishes and utensils to easily prepare meals and a dishwasher to help clean up. This condo will comfortably accommodate as many as 6 guests. The Summerhouse is conveniently located on the East end of Panama City Beach, minutes from the best area attractions, dining and more. This family friendly resort offers a number of recreational resort amenities for our guests to enjoy. From swimming to tennis, video games to shuffleboard! There are activities are available for guests of all ages! You are promised a memorable vacation at the Summerhouse in Panama City Beach. Overall we had a great time and the condo was nice and clean. The only complaint we had was we had NO INTERNET the entire time we were there even after a call to Book That Condo about it. We booked summerhouse 710B for a week. The check in process was very easy. The staff was great about communicating with us to guide us through the process. We found the condo to be clean but in need of some minor repairs. A tech arrived quickly and did what he could. Some of the issues need further attention that he couldn't address. Slider to balcony was very hard to open, it needs paint and new rollers. AC in master bedroom is very weak. Carpet tacs are coming through carpet. Overall the grounds were very nice and really the highlight of our stay. The pools and view of the gulf were great. The condo itself needs some more updates and repairs to make it a great place to stay. It appears as thought many items and furnishings have been replaced but the process is not complete. If they fixed the issues, I would rent again. Thank you for choosing Book That Condo and for sharing this review. We appreciate your kind words and your feedback. We will look into these repairs and let you know when they are complete so we can book that return visit! Thanks again for your business, we appreciate you. We thoroughly enjoyed our stay. The location was excellent. The room was clean, and the view was amazing. I highly recommend this condo. Thank you for sharing this review, we are so happy to read that you enjoyed your stay and that the location was excellent. Please, give us a call when you are planning your return to the Gulf! Had a great time here! I would recommend Summerhouse 710B Condo! We are so glad that you had a great time in Summerhouse 710B. We hope to see you again soon! We book the week before so finding a place was not easy. We did find this vacancy and booked with a $500 security deposit- that was steep! The location was actually great since we had a 4 yr old and didn’t want to be in all the party area in the beach. Nice quiet pool and beach area for families with younger children. The process to stop in the rental office at the opposite end of PCB was not explained and when we checked with the front desk to see if the unit was ready they told us no but never mentioned that we had to go to the Book That Confo office. We had about 4 hours to wait so we changed to our swim suits to enjoy the pool and beach. Then about 3pm I decided to call the number on the app to check- only to be told I need to make a 30 min drive (spring break traffic) to sign papers and check in. I was not happy about that since we had been in the pool and not dressed. But we went! Then come back and the unit was ready until after 4:30pm. Finally got in the unit and it was very outdated and the beds are very uncomfortable. Nice location and floor plan but needs updated furniture, kitchen and BEDS. Balcony view is great too but the rusted outdoor furniture and table was a concern for our 4 yr old to enjoy eating outside due to rusted metal edges of table. I would love to stay at this complex again but a different more updated unit would be needed. Elevators are very slow but that’s common in PCB. Thank you so much for taking the time to share your experience with Book That Condo. We are happy to read that you found this condo available only a short week before arrival! However, we are terribly sorry if you felt like are Spring Break Check-in policy was not communicated well upon your booking confirmation. Having you come to the office was our way of confirming you were in fact a family so we could return the $500 deposit. We understand the inconvenience this must have caused since you were in the pool, and we hoped that having the deposit returned made that trip worth it. 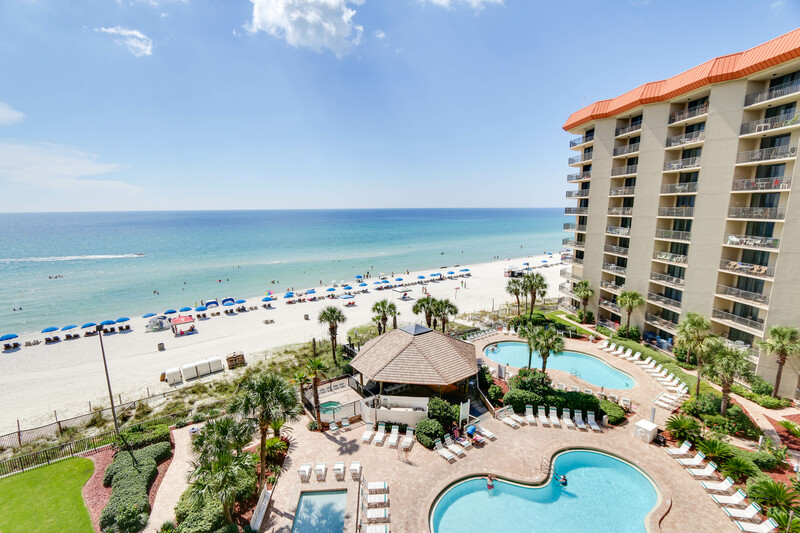 Thank for your comments on aspect of the condo that need updating, we will begin working with this owner to ensure this condo is upgraded before you plan your return visit to the Gulf! We are committed to offering the in best customer care while providing a well-maintained and comfortable atmosphere for all of our guests. We can promise you that the highest quality standards will be met in the future and your concerns will be looked into further. We do hope that you will let us know when you plan your return! The outdoor area was perfect, plenty of chairs, large covered area facing the ocean, beautiful heated pool. But that was outdoors. Indoor area was horrible. Very old, carpets were dirty, too many bad things to list. Thank you for taking the time to share your experience with Book That Condo at the Summer House Resort. We are so happy to ready that you enjoyed the amenities this resort had to offer. However, we were disappointed to read that you found your condo to be dirty and out dated. We appreciate your feedback as we strive to improve with each and every stay. Please contact our office if you would be willing to give us a chance to turn your experience around. We appreciate your business and hope to see you again soon! The view of the beach was fantastic and a very friendly staff at the condo. Thank you for taking the time to share your experience with Book That Condo, we look forward to helping you plan your next visit with Book That Condo! The condo was not what we expected-stains on carpet and furniture. Rust on outside chairs. Light switches with no idea which one belonged to what. Mildew on shower curtain and the masterbath smelled like urine. Very outdated condo. Summerhouse is a great location, but this condo needs updating. Thank you for taking the time to share your experience in our condo. We are troubled by your observations and sad to read that you were disappointed in your stay. We are committed to offering the in best customer care while providing a well-maintained and comfortable atmosphere for all of our guests. I can promise you that the highest quality standards will be met in the future and your concerns will be looked into further. We greatly appreciate your comments about aspects of the room that need updating. We strive to improve with each and every stay. Please call our office when you plan your return to the world's most beautiful beaches. It would be our pleasure to welcome you back with a special returning guest discount. Thank you so much for taking the time to review your reservation with Book That Condo. I'm so glad you enjoyed your stay at the Summer House Resort! Please call our office when you plan your return to the Emerald Coast. We would love to offer you a special discount for returning as our guest. Thank you again for your business and for sharing your experience. We hope to see you soon! It was a wonderful experience for us all. We loved the beach, the pool and the room. They only problem was the sliding glass doors on the deck. They are hard to open and close. Will probably look to use again someday. Oh, and the elevator was the worst. Long waits to get it, and very hot when riding it. Thank you so much for taking the time to share your experience with Book That Condo. I'm so glad you enjoyed your stay at the Summer House Resort! We will share your feedback with our team about the aspects of the room that need updating. Please give our office a call when you are ready to plan your next visit! We would love to offer you a special discount for returning as our guest. The location of the condo and the view was amazing. Being able to use the elevator was a bit challenging. Overall, we had a great trip because we spent most of the time in the pool or at the beach. We weren't impressed with the condo itself as the beds were very hard, and the carpet was grossly stained. The furniture was stained as well. The sheets felt like paper. There were also limited utensils, so cooking in the condo wasn't easy. Probably won't stay at the same condo again. Thank you so much for taking the time to share your experience with Book That Condo. I am so happy to read that you enjoyed your stay in Panama City Beach. However, I am troubled by your observations regarding the cleanliness of your rental unit. I understand your disappointment and the inconvenience this must have caused. We are committed to offering the in best customer care while providing a well-maintained and comfortable atmosphere for all of our guests. I can promise you that the highest quality standards will be met in the future and your concerns will be looked into further. I do hope that you will let us know when you plan your return to the Emerald Coast. We would love to offer you a special discount for returning as our guest. My family and I enjoyed a relaxing Spring Break at Summerhouse 710B. The condo was clean and well furnished. It was seconds from the beach and had an amazing view of the ocean from the ocean from the balcony. The pools and hot tub were awesome. We will definitely be back! Thank you so much for taking the time to review your reservation with Book That Condo. I'm so glad you enjoyed your stay at Summer House! Please call our office when you plan your return to the Emerald Coast. We would love to offer you a special discount for returning as our guest. Thank you again for your business and for sharing your experience. We hope to see you soon! Condo was exactly as described. We love to stay at Summerhouse, very family friendly. We will be back next year. Overall a nice place to stay, great location. Great for families. Could use work on sliding doors and a little updating. But overall a nice place to stay. The complex as a whole was perfect! It was clean and well organized. The room we were in had a great floor plan and plenty of room. The staff that spoke with me on the phone were very nice and helpful. The problem I had was 1) there was what looked like sheet rock dust in the master bedroom on the furniture and the bedspread 2) the carpet was horrible and desperately needed to be replaced 3) there were only 3 face cloths in the condo and there were 4 of us. I contacted the number given me for assistance and Judy stated she would call Housekeeping, no one came. I cleaned the dust up as best I could and shook out the bedspread but left it on the floor in the corner. There was remodeling going on in 809B. Strange that the dust was only in the master bedroom. Markings on the tops of the furniture appeared to show someone had tried to wipe it down. A thick film remained. GREAT VALUE ,Overall the condo was nice,if the owner spent $200 or $300 the condo could be great(balcony furniture in bad shape,pots and pans need replace and a bigger skillet also toaster only toast on one side.Other than that the pool area and beach area was GREAT !!!!! This place was as described to be. It was clean and located in more family oriented beach. The check-in was easy, service was great and facility personnel were friendly and efficient. We started off a little confused with our vacation rental from Book that Condo. Our original condo that we booked was NOT the condo that was assigned to us and we did not discover this until a week before we left on vacation. It was told that the condo we original booked was no longer doing business with "book that condo" and they fixed us up with another one. The second one that was assigned to us was at no additional charge and was bigger. The first one slept 6 and this one slept 8. The only difference was this second condo did not have an on site facility workout room which is important to us. The condo we stayed at was very nice and we truly enjoyed the view of the ocean from both the living room and master bedroom! Easy access to the beach, pools, and we discovered the Park Pier about 3 miles down the road which was awesome! I enjoyed sitting out on the balcony early am and evenings. Only thing that needed to be worked on was the sliding doors from the bedroom to the balcony - very hard to open. Also the master bed was very hard and uncomfortable - could truly use a new mattress. Summerhouse Condo's were awesome. The entire condo was very clean, location, furniture, amenities, etc. were great. I would recommend this room to anyone. If I go back to Panama City again I will be staying here. I loved not having to worry with a key and worry about checking in and out of the condo. Entire experience was awesome. Very pleased. Summerhouse is a very nice place! Overall a good experience. Book that condo was a very easy to work with. We stayed in 710B, it was clean and nicely decorated. It could used some updates as far as the sofa (very uncomfortable) and matress in the master bedroom could use a more comfortable matress pad or replacement. Also has mold/mildew in both showers that need attention. Beyond that, everything was wonderful. We really had a great family time. Our condo was very clean and ready for us to enjoy our week. It was exactly the way it looked on the website. Our rooms were very spacious and delightfully decorated. All of the facilities were clean and assessable. Having two pools and being right on the beach was awesome feature. The location of the hotel was great.. being on Thomas Drive we were away from the crowd but close enough to be there in a few minutes. We were close to some great restaurants, Hammerhead Freds was awesome. I would highly recommend Summerhouse to all of my friends. It was a nice place only issue was the drain which drained water very slowly. This is our 4th time staying here and we absolutely love it! It's very spacious, and the location is quiet. The balcony view is perfect. We'll stay here again as long as it's available. Book That Condo is an excellant company to work with. The condo was just as they described. Outstanding experience. Condo very dated and did not have working toilets for two days. The property and location was great and the pools were wonderful. Loved the Summerhouse but would look for another unit. The condo location and amenities were great! Book That Condo however was not. Check in was at 4, we were to receive a call with the door code, we called at 20 after and felt the rep with Book That Condo was not nice or helpful. we did not get a call until almost 5pm. The Condo had missing light bulbs and remote batteries for the TV;s, seriously not a big deal, but we called AND emailed to get these replaced, no one called back or replied. When we called, the rep was nice and said someone would bring us what we need, but no one came, or replied to us by phone or to the email we sent. Other than the outdated TV's and dirty carpet, the condo was fine. Loved the shower head, great pressure. :) We did believe we had beach chairs included with our rental, but the guys on the beach said we did not. We were a bit surprised the basics, like dish detergent was not included, as it has been with all other condo's we have rented. Some larger cooking pans would have been great. But all in all, it was fine. We had a great time. Summerhouse is definitely a great place to stay and we would definitely stay there again, but we would not use BOOK THAT CONDO again. ps- a few months after we reserved the condo, I received an email that we needed to put down a $500 Spring Break deposit... I replied that I booked months ago and that was never mentioned.. They did reply that they were wrong and we did not need to pay that. Just another example that BOOK THAT CONDO needs to step it up. We rent condo's 1-2 times a year. While we were disappointed with the rental company, we loved Summerhouse! Its clean, quiet and the pools are nice. Only 1 was heated when we were there. We were happy about that! You get what you pay for and we were very happy! Hi Meghan, Thank you for taking the time let us know where we didn't hit the mark during your stay. Our guests being happy and enjoying their vacation are very important to us. I will be forwarding your comments to all departments to review how we handled your issues. We will also contact the owner on your behalf to talk about the older TV's and making sure his condo has just what a guest needs when they arrive. It is through our guests giving us feedback that we make it better for the future, so thank you. Warm Regards, Your Book That Condo team. Bath rooms dirty, trash can filthy, old worn dirty carpet, cabinets and 2 beds were found broken, several lights did not work or defective light bulbs, etc. We were brought light bulbs and a pan for the kitchen. Notified Book That Condo Mgt in person and email photos. We requested refund on cleaning fee, 2 weeks post vacation and still no deposit or refund of cleaning fee. Book That Condo was recommended by a friend. We recommend renting directly from Summer House, $300 per week cheaper, up to date condos, with owners who keep their property updated, clean, and take pride in their property. We saw several for rent that were in excellent shape. Summer House staff and property was great all week. Far enough away from Spring Breaker activity for a family. We have seen a number of lovely units at Summerhouse but this one was not one of them. Badly needs updating - kitchen cabinets, countertops, carpet and televisions. Sliding glass door in bedroom did not open. Light fixtures and fans in bathrooms were very noisy. Refrigerator door opened the wrong way. Lent basket in dryer was torn up. Never again in 710 B unless major overhaul. Hi Linda, I just read your review and wanted to take a moment to say we're so sorry that your experience with this condo was not up to your standards. I did review our maintenance logs and all your reservation notes and did not see where you contacted us at any point to let us know that this condo was deficient in the accommodations or condition. We take our guests needs and concerns very seriously and do our best to make sure every vacation with Book That Condo is great. We left you a voice mail message on your arrival date with our contact information in the event there were issues or that you needed anything but we did not hear back from you. We would love the opportunity to assist you in your next vacation to show you that your overall experience is important to us. We thank you for your candor and will share that with our owner. Thanks so much, your team at Book That Condo. Very pleasant stay. Never too crowded at the pool or on the beach. Kiddie pool was perfect for our little one. Condo was very nice and very comfortable, even for our 8 month old. We really enjoyed our stay! Enjoyed our week stay at the Summerhouse and look forward too staying again. Everything was perfect! Great accomodations. Great location. Didn't want to leave! Our stay lasted from May 1-8 2013 and we had an amazing trip! The condo was well cleaned and supplied with an abundance of start up goods. Book That Condo was very helpful through the entire booking and check out process, and I will definitely be using their service again! The stay was great.However,the furniture was somewhat outdated. My only complaint. I will be staying there again. Thanks, Book That Condo! !